Initially, it was a throwaway line from my pastor, Andrew Battistella, that I could paint all the time that gave me the idea to paint live each week for a year. I’m fairly sure he didn’t expect me to take him seriously, but in the way of God stuff, it began to flower into something that I’m sure God had orchestrated. Prophetic painting during worship for a whole year! What an intriguing idea and an amazing challenge! What a cool God-assignment! I call it a challenge because there was a sense of would I rise to it? Would I accept the commitment, which was large, and one that I didn’t take on lightly? It would mean hearing from God for a new image every week for an entire year. 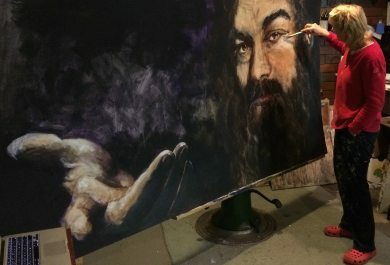 It also meant a considerable outlay on materials and framing and that I’d have no weekends away for an entire year – unless I could paint during worship. Somewhere though it was an exciting concept. It would mean drawing closer to God to be able to get God images each week. It would mean being able to hone skills and explore the meaning of prophetic art. It could mean a greater understanding of worship, and on an artistic level, it would mean consistently creating rather than the previous ad hoc occasional and sometimes frantic production to meet a deadline that I was used to. It might even mean creating a work that the Father touched Supernaturally with anointing so that it carried healing or ‘presence’ wherever it went. The idea sat with me for a month or so while I debated with God, but eventually I made the commitment and started on the weekend of March 13th -14th, 2015 at a 24 hour worship event hosted at our church by a combined group that represents churches throughout our city. At a personal level, I’d just come through an extended bout of ‘black dog’ or depression, where I hadn’t painted for around three months. I had a breakthrough at that worship event and it became Week One. I’m very grateful to the pastors, Andrew and Melanie Battistella and the worship leaders, Ben and Danielle Reeves of our church, Mt Clear Church of Christ, for the encouragement they have given me and the freedom to pursue the challenge during worship. I suspect that there aren’t many churches around that would have allowed an artist the freedom to paint each week and given over an area at the front of the church for an ugly easel and a bit of a mess. Doing the challenge has changed my life and having the encouragement to pursue it has been a big part of that. At the beginning of the challenge, I had a honeymoon stage where nearly everything I painted was of a standard that I was happy to publish on my Facebook page. (12) As well, I joined an international prophetic artist’s page and published my works there. (13) It’s encouraging to pick up 300-600 likes and lots of lovely comments about work. I began to think that I truly had discovered my sphere of influence. Around about Week 18 though, things started to change. 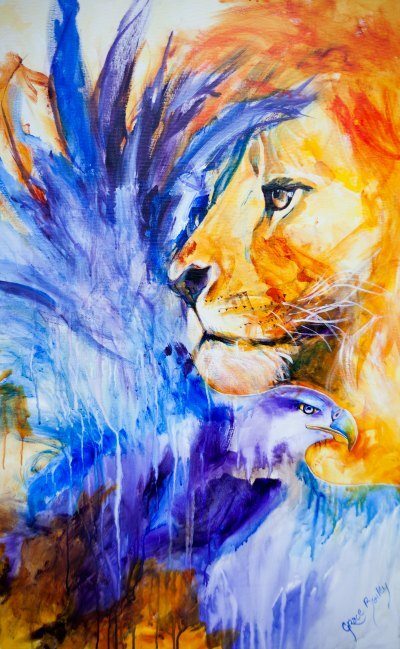 I’d gone from doing images of eagles and lions, which were very popular, to images of more spiritual topics. One in particular that I have already discussed in Chapter 2 was from a picture I’d seen during worship of three animals in different postures. Just to recap: one was a tortoise in its shell, one was a dead bird, and the other was of a rabbit running. I created a work where each came out of its repose. At the top of the work is a feather to represent the move of the Spirit, which we’d started to experience as a church. The animals represented different people’s reactions to it. Some retreated into their shell like a tortoise, some laid down and ignored it like they were dead, and others ran towards it. The painting was a call to those people to embrace what the Spirit was doing. This work was not accepted with the same universal enthusiasm! For several weeks after that work, I did paintings that I knew had to mean but were not successful as art works. By not successful, I mean that they were not works that I could happily publish for wider consumption or put my name to. They were full of meaning (to me) but executed poorly, which meant that people were unlikely to want to look at them. And I certainly didn’t want them to be seen. This is not about pride but excellence. As well, the works needed the explanation before most people understood what they were about. I purposely work at not giving detailed explanations so that God can speak more freely about meaning. However, if the meaning is very obscure, it seems to scare people away from too much investigation. As well, I’d suddenly started to have trouble hearing what to paint each week. While I’d become more relaxed about the regular public painting, I was now finding it much harder to ‘know’ what I should paint. I’d dropped into a pattern of asking for the image around Thursday, refining it in my head till the weekend and drawing it up on Saturday afternoon. In fact, I had become relaxed enough that I could comfortably plan to draw it on Sunday morning without anxiety. I had come to the point that I could trust God enough that I wasn’t as stressed as I had been at the beginning, which was a good thing, but sometimes the works just weren’t turning out. So my level of trust had risen, but the honeymoon was over! And then I had a major win. I was invited to paint at a major YWAM conference, Gofest Melbourne, where I had the honor to paint on stage with Loren Cunningham, the founder of WYAM and an extraordinary man. The worship was amazing and the atmosphere electric. We’d been encouraged to continue painting while the speakers were presenting, which is always marvelous as it gives you more time to finish. I was really chuffed to be asked to paint at this conference and I had waited on God for an image that would appeal to a youth audience. Personally, I love rock music and the life and energy of live music. I also relate very much to the beat of the drums, particularly if it starts into warfare. 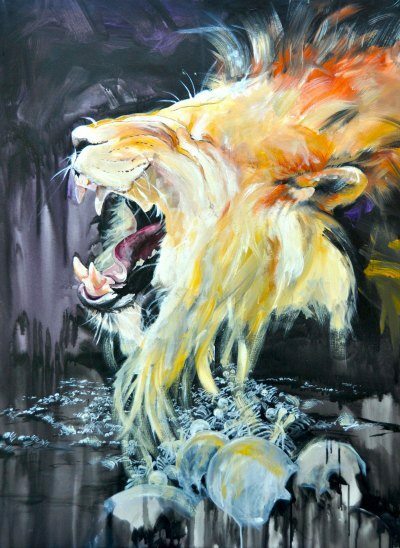 During such an earlier session, I’d had a sense of the Lion of Judah in all His power and authority roaring during worship drumming, so that was what I painted. The whole painting flowed from beginning to end, from the initial drawing to painting on stage. The drawing could have been difficult as I was creating a new image from several reference images, as well as from my imagination, and that can often be very tricky to get right. But this just flowed! When I got to the conference and started painting, it was the most amazing time. Every stroke I did was right, with no over-painting! The colors were right, the proportions worked and the painting has life! I’d never had a painting work that easily, ever! I discovered later that I’d painted this one with angels, which is why every brushstroke was right without reworking. But more on that further on. I actually painted six paintings at three different venues that weekend, which was exhilarating and exciting, but at the same time draining. Painting can be very tiring, especially when it’s done in an attitude of extravagant worship. Shortly after that weekend I had the next big win of the year; the Inflame Sounds of the Nations Conference in New Zealand with Josh and Amberley Klinkenberg. This was the third worship conference in New Zealand that I’d painted at and when I arrived, I had no idea of what to paint. I’d certainly been asking but had heard nothing so I was really worried about whether I was hearing from God accurately. Fortunately God came through with images that correlated with each of the major sessions throughout the conference. That kind of validation that you’re hearing correctly is invaluable and so encouraging. 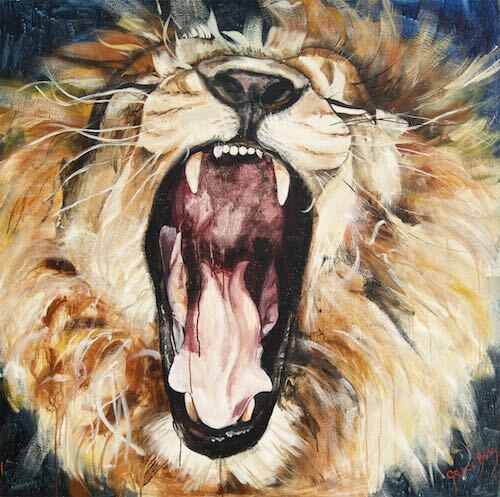 The first painting that I did there was of a roaring lion, which Dan McCollam, International Director of Sounds of the Nations said had a “Mona Lisa’ quality to it in that when you looked at the lion, it could be yawning or roaring. The yawn represents the ‘rest’ of God; the roar represents the warrior-victor. I was pretty impressed with that interpretation! 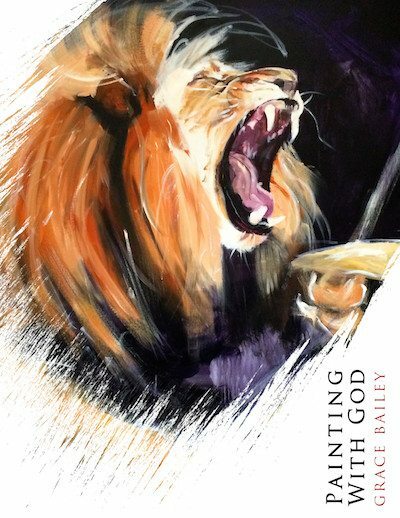 Start your prophetic art adventure with the 'Painting With God' eBook. The following weekend was the midway point of the entire year, week 26. It was another Unite worship event; this time the yearly conference. Corporate worship propels the atmosphere to generate new levels of anticipation, and this one was certainly a winner! We’d been experiencing an increasing sense of God’s presence during worship along with occasional glimpses of gold dust and heavy anointing in the meetings. I really had a sense of wanting to reveal the supernatural so I’d intended to paint another angel. I’d seen an image the week before that had resonated and I thought I could pull it off, but as I began to draw it up, it just wasn’t working. Bear in mind that I haven’t actually seen an angel so it begs the on-going question of how to paint one. In fact, I didn’t start the angel painting until the next day. When I did, worship was amazing. (We have lots of wow worship!) As the painting progressed it morphed and changed from my unsuccessful initial drawing. The angel’s face took over the whole board when I’d intended it to only be a small section of the work. This isn’t something that I would normally allow to happen, as drawing is such an important part of a successful painting. As well, the randomly applied texture that I’d overlaid the board with as undercoat seemed to mysteriously enhance the image, becoming part of his chin and cheeks. The image ‘grew’ organically without much reference to any photo. Vivid eyes and transparent skin appeared. What was truly amazing however, was when a friend told me of a previous dream where she had seen an angel with very vivid eyes and transparent skin, like I’d just painted! So here was me, really wanting to see and paint angels and twice I’d unknowingly painted them as others had seen them without actually seeing them myself! Ho, hum... sigh...! Lest I sound as if every painting was an amazing success, there were certainly dud weeks where I created works that I was not comfortable to publish. Most works needed extra work at home before publishing, but some just cried out to be over-painted with another image! While my intention was and is excellence, sometimes the execution was unsatisfactory, and the work didn’t make the grade. One of those times was when I painted a landscape without a reference image. I wanted to test the theory that I should be able to paint well with just the Holy Spirit’s leading and no reference image. Bear in mind that I’ve had seven year’s tertiary education plus years of practice, so I can draw and apply paint okay. However, I can comfortably say that that work was the least successful of the entire year’s effort. I realize that some people paint exactly that way but it certainly didn’t work for me and as a result, is not a method that I advocate or intend to employ further! It defies common sense to think we can do our best work without a reference image unless we’re experts in that area. That is not to say that sometimes a work doesn’t take its own path. It happened during week 32 when I thought I was painting a fairly abstract work of violent stormy waves with a small boat signifying God’s power over storms and that we shouldn’t worry. (14) However, as the work progressed, the atmosphere changed and I started to include some finer detail. This continued in the studio later and created an intricate web of fine lines over much of the lower section of the otherwise loose and abstract work. As I painted away with a very small brush, it came to me that the complex and seemingly random detail below the surface of the water represented the extraordinary complexity of the spiritual world around us, which interacts with and impacts our circumstances that we often aren’t aware of. There we are in the little boat (which you have to look hard to see because of its size) and we’re surrounded by a multitude of other entities. As well, two unintentional faces appeared in the sky, as if they are looking down on the small boat. I titled that work “We Are Not Alone”. (15) I was really surprised by that work as I didn’t intend to do complex detail, but was pleasantly delighted with the outcome. Another work, which also included complex detail, was “Valley of Dry Bones. Ha! Piece of Cake!” It’s a longwinded title of a roaring lion, which appears to be laughing over a receding stream of skeletons and bones. Painted live over two weeks, I was fairly trepidatious at the outset as skeletons are complex and difficult to execute. You could call it a lack of faith in God or my own ability, but I was dreading it. Despite my fears, it all just worked, and much more than that, the work spoke to someone about lost dreams being restored, which is super cool! It amazes me regularly the breadth of interpretations that people garner from my paintings. They often go completely beyond anything that I had thought about when I was painting. Initially I was very concerned that I didn’t get the in-depth meanings that others seemed to, until one day I heard a very famous speaker ask for two interpretations of a prophecy in tongues on stage in front of a large crowd. Those interpretations of the same prophecy were very different, which caused me to question their veracity. Both the interpreters believed that they’d heard from God, but their interpretations were very different. Eventually I realized that if the English language can be interpreted differently using the same words, how much more can the Supreme Creator relay different messages through a visual image? When you think about it, the English language has so many words that sound the same but have different meanings, such as there, their and they’re. Or take the word ‘game’, which could mean a game like football, or bravery, or animals that are hunted such as pheasants. 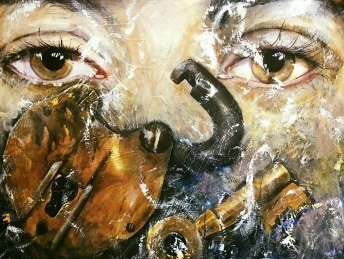 If the English language could have so many meanings, it makes sense then that a painting could also speak seemingly contrasting things to different people about individual circumstances. I’ve learnt to relax and trust that God is doing the speaking and that I don’t need to. In fact, I purposefully avoid giving my interpretation when I can or I leave it fairly vague. I stopped trying to give interpretations when I had the horrifying occasion that someone was robbed of the touch from God that they’d had because they didn’t trust their own hearing. If English has multiple interpretations using the same words, so can the Supreme Creator. With six points of line-up, this one was definitely divinely orchestrated! 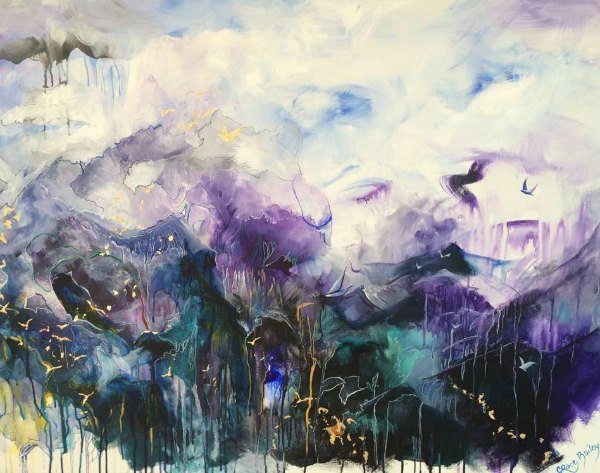 During week 35 at a prophetic conference titled; ‘Unlimited’ at Hillview Community Church, Rowville, Melbourne with Jerome and Miranda Nelson from California, hosted by pastors Gary and Sarah Morgan, I painted a work which was indisputably miraculous in outcome. I love painting at conferences, as the collective atmosphere of excited and expectant people seems to take the presence of God to a higher level. I did two paintings that weekend but it’s the second one that was the real surprise. I’d painted a large work (180cm x 150cm or 6’ x 5’) the night before that was quite draining because of its size and complexity, so I wasn’t expecting a great result with the second painting. To expect to crack two good live paintings out of two is a bit of a stretch. Lovely if it happens but I never take it for granted! By this stage of the challenge, I’d painted a number of eagles and was reasonably confident with painting them. This one was to be cropped along one wing with the remaining wing forming a panel up the left of the canvas like a large ‘L’ shape. I’d intended to do a range of mountains and a sunset behind the eagle to represent the theme of the conference; ‘Unlimited’. I started the sky with an orange brown which seemed to take its own direction, leaving no room for mountains. The worship, led by Naomi Cavanagh, was electrifying and as I often do, I was dancing while applying some of the paint. I’ve been known to get a little carried away and over-do it when I dance while painting, which is what I thought had happened when I finally put that color down. However, as I went to paint out some of the apparent heavy-handedness, I quite clearly heard to leave it be, so I went on with the rest of the very loose eagle. 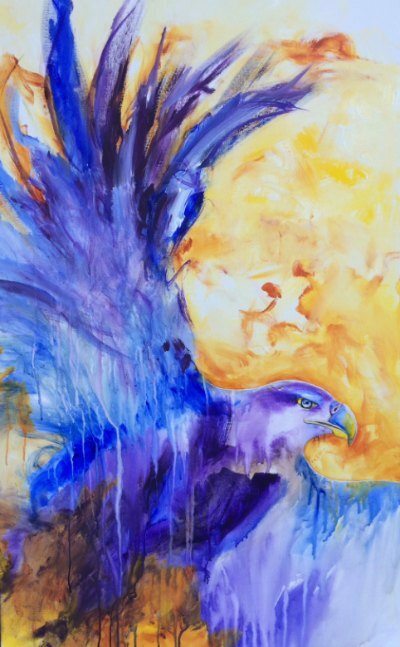 This eagle was always going to be more abstract and looser in style than the previous night’s work. I realize that it is a pillar of secular art that an artist needs to develop a recognizable style and stick to it within the same body of work, but this is another aspect that I’ve rebelled against. Some works demand to be tighter or looser depending on their subject matter and the image portrayed. Besides, it’s very difficult to paint carefully when the worship is wild! As I went along I hadn’t been happy with the work because I thought I’d overdone it and decided to finish when worship ended, instead of continuing to paint through the sermon. I asked God what the marks that He’d told me to leave were for, but I didn’t get any inspiration. Afterwards however, someone excitedly asked me if I could see the lion in the background. Upon closer inspection, I could see an outline of a cat with an eye and a mouth in the right places. 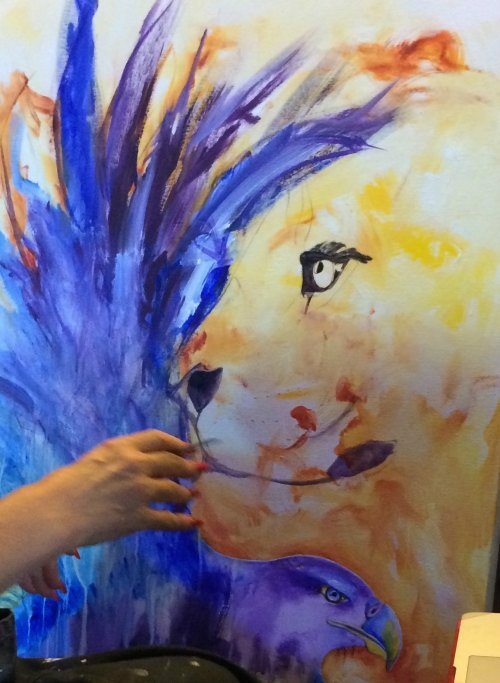 Overnight I had a sense that I should paint the cat into a lion. I found an image that I’d already saved in my references, which fitted amazingly well. So well in fact that a little ‘squiggle’ randomly applied the night before (or so I thought) exactly fitted the snout and two other random marks formed the lion’s mouth. The beginning of the eye was already there in the right place as well as the profile of the face and the mouth placement. The odds against six random marks lining up in exactly the right places would be astounding. But that’s what happened. The eye, the snout, two areas near the mouth and the outline of the lion’s face all lined up perfectly with the reference image and was such an easy fit that I finished more or less when worship finished. The ‘footprint’ of the lion had been painted the night before without any reference image or prior intention. I really believe that the supernatural intervened to create a piece in the natural with this painting. Up until that time, I’d often wondered and sometimes doubted whether I was actually hearing God. After the steady dialogue of the night before on colors and placement, this one had been surprising because the only thing I heard was to leave the random marks in the background and yet it was clearly a God-orchestrated piece! This is what Gary Morgan had to say about that work: “A word the Lord has continued to speak to us is around the Apostolic and Prophetic working together, completing not competing, causing the fullness that Jesus speaks about to manifest simply captured in this word ‘When The Lion (Apostolic) Roars, the Eagle (Prophetic) will Soar’. This work became one of the highlights of the year because it was so evident that the supernatural had intervened in its creation. There have been lots of other times that I thought that had happened, but this was the most definite. I had been contemplating the total sum of my life and where God wanted me to be as I felt lost and lacked direction. I know what I am good at and what I have done over a 50+ year lifetime, but I was at a crossroad and just couldn’t put my finger on the ‘thing’ that would truly inspire me to go into all the world... I am a wife, mother and grandmother. I am also a worship leader, singer, preacher, writer, mentor, encourager, one who builds others and who loves all those roles. Each of those things are unique and any one of them would be enough, but nevertheless, there was still something missing. As I grew up both parents worked long and late hours so I was often alone with my siblings after school until dark. I didn’t have any direction and wound up a single mum at seventeen. I was frightened most of that time and empty too. It was a major road ahead to try and raise a child whilst still being one myself. I was grossly over weight and miserable. I even left the country to ‘marry’ someone I thought would have been my forever man. It didn’t work. I just kept stumbling along until I had an encounter at 28 years-old with Jesus that changed my life forever. The journey I began all those years ago has been one of miracles of healing past hurts and encounters with Him in the secret place. I have grown exponentially in all areas of my life. I found a wonderful tribe where I feel completely at home in an organization called Sounds of the Nations and have been a part of that for three years now. Even with all of that, there was an emptiness and I just began to pray and soak in His presence for direction. Then came the painting!!! Someone commissioned a painting for me: a Red Cardinal. Grace Bailey, the artist who painted it, told me that the wings were translucent because she wanted me to know that I wasn’t just a singer, but there were many facets and depths to me and not just the obvious. I was stunned, honored and overwhelmed. Could she have known what I was feeling? Firstly, the word ‘cardinal’ means ‘of great importance’. I was so important to God and he had gone to such an extent to tell me in a painting. It got better and better. Secondly, the Red Cardinal is a symbol of love and relationships. This little bird, because of its color and powerful voice, tends to stand out from the crowd. They can get your attention when nothing else can reach, especially in times of depression and grief. Their color also signifies vitality, importance, faith and power. Their song is loud but very clear. It sounds like ‘cheer cheer’. It’s the sound an encourager would make. The call of a cardinal can come to cheer us up, or cheer us on. The unique clarity of their call can be used to gain our attention and lift us from our depression, our sorrow or perhaps even the mundaneness of life. Cardinals are great parents who care well for their young and provide safety and protection until the babies are out of the nest. They exemplify health, strength, vitality and self-preservation. They encourage good diet, healthy eating and a fight for health. Having had a lonely childhood with migraines and no direction, I waded through a quagmire of life circumstances not realizing that my life was special, unique and worthy to be lived. However, if I was going to do it, I needed a reference or a definition that I could work with, otherwise, how would I know whether what I was doing was right or not? It took me quite a while, but eventually, I came up with a simple definition; a message from God in visual form (as opposed to dancing, music, verbally or the Word). It is visual imagery which speaks God’s words; be they photography, drawing, painting or any other kind of visual ‘art.' From here on throughout the book, I’ll reference painting because I’m a painter, but it doesn’t exclude any other form of visual imagery that’s created with a God purpose. Most of what I reference is actually ‘worship art’ that was created live during corporate worship as opposed to the more carefully crafted images of prophetic art. But both have the same purpose: to declare God’s messages. What makes some art prophetic is that the inspiration for it comes from the Holy Spirit and that God speaks through it. It should always be edifying, comforting or encouraging (8) as that’s the bottom line for all prophecy. If touched by the hand of God, prophetic art can release healing or power or emotional freedom in a way that spoken words can’t. It can bring an awareness of beauty or awe that really can cut between bone and marrow and get right to the heart of a person’s soul. If Holy Spirit partners with the artist and imparts His presence into the work, it can be an instrument of healing or revelation or encounter long after the work is created. (12) A huge thank you to Rebekah Jones for facilitating and maintaining the Facebook site; Prophetic Arts for Jesus. With over 11000 members, it offers encouragement and peer review to worldwide artists.